Head over to the most popular spot on the lake, The Party Cove. This spot is a gathering place of boats and party barges. If you are looking to party and have a good time this is the spot to go. 80% of bookings go to the Cove and have a great time. Austin Rental Boats offers fully captained boats to take you out to the cove and have plenty of things to keep you entertained. Hula Hut is a great Mexican food Eatery that has a stellar view of Lake Austin. If you want to get on the lake before or after lunch, stop by Hula Hut and get some food and Call Austin Rental Boats to reserve a boat to take you out on the lake. This is also a great place to stop and get a quick bite. It sits right next to Hula Hut and can be less crowded if you plan on a more chill atmosphere. The food is great and the drinks are amazing. This place also has a great view of Lake Austin. Hula hut and Able’s share a floating dock that you can use for parking your boat and getting picked up by a Boat Rental company. Ski Shores Waterfront Cafe is as Austin as they come. Chill practically on the water with live music. Driving your boat? No problem! Pull right up into one of the boat slips they have ready for you. This place has great burgers and is a quick detour if touring on the lake. Nestled up past the party cove, County Line on the Lake is a primo spot to go and get picked up so you can grab some delicious BBQ after the lake. This place is a must try if you are wanting some good Texas BBQ. For those of you who are Daredevils, stop by the Rope Swing on Lake Austin. Accessible by Boat only, this ropes swing will launch you out in to the Colorado River. This is a daring and dangerous activity but it is still loads of fun! Take a cruise of Lake Austin and experience all what it has to offer. You can spend an entire day on Lake Austin and still have not had enough. 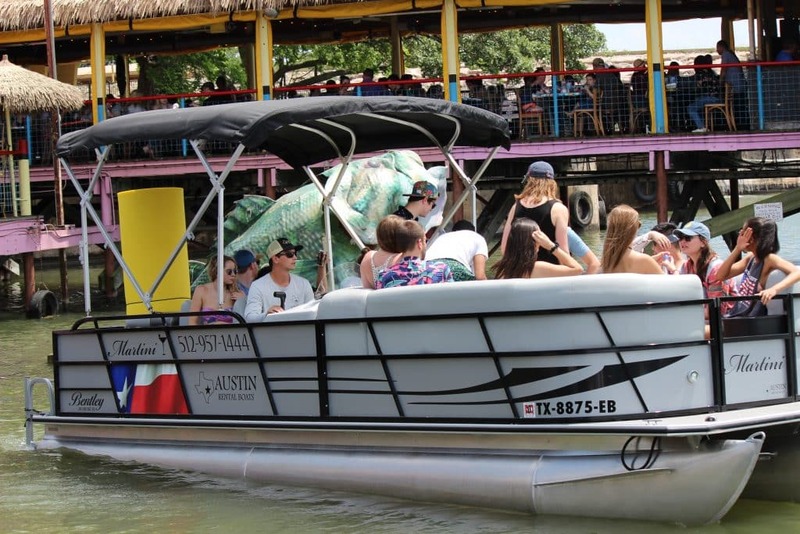 From the Party cove, to big party boat trips, to lake tours and business outings, Austin Rental Boats is the premiere boat rental company on Lake Austin and can accommodate all your boating needs.